A Tutorial on VSAT Installation. 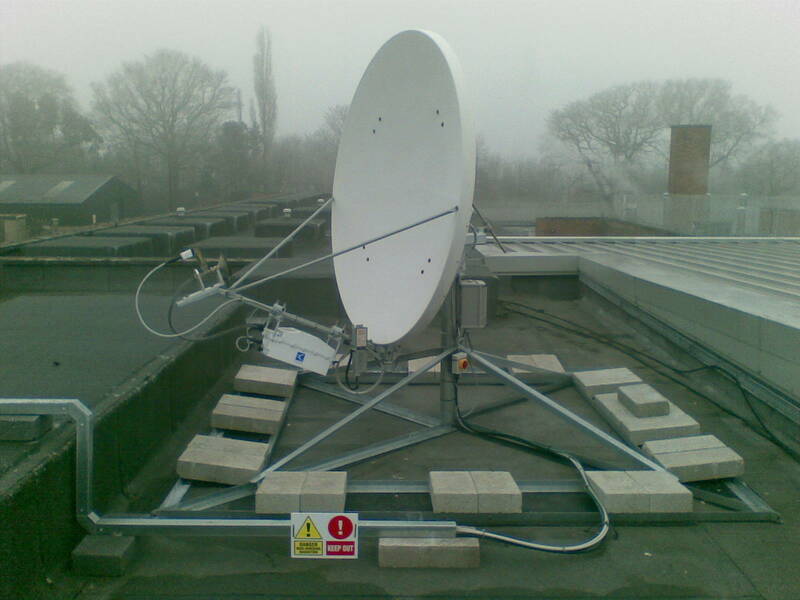 When chosing a site for a VSAT installation, the antenna needs to be located with a clear view to the satellite. Access to the antenna should be restricted to prevent any damage or harm from occurring to either the antenna or people. Ideally, the antenna should be sheltered from wind. The outdoor unit (ODU) is mounted on the feed arm in front of the antenna and houses the Radio Frequency (RF) equipment required to transmit (TX) and receive (RX) from the antenna. Ortho-Mode Transducer (OMT) the Tx and Rx waveguide joint. Microwave filters which protect the LNB from the Tx signals. Installing a VSAT can be very dangerous especially on a roof. Follow the instructions carefully to ensure that the antenna is correctly assembled. Care must be taken when working near the edge of roof tops such that you do not fall off or drop anything on people who may be below. Never work alone and always look out for each other. Click Here to download the PDF format RF Radiation Hazard sign. This type of installation is usually a pole mount which is bolted securely to the ground. The pole can be concreted into a hole but in both cases must be completely vertical. This is a quickly deployed mount which consists of a frame constructed to hold the pole vertically and securely whilst providing a large base for the addition of ballast. Ballast (heavy bricks or concrete) weigh down the mount preventing the wind from overturning the antenna assembly. In extreme conditions even a permanent mount can sustain damage and so a sheltered location and saftey lines attaching the mount to the building should be considered. The antenna could otherwise be blown of the roof of a building. A structural survey is required before any such mounts are installed on a roof to ensure the weight is not a risk to the building. Usually two coax cables carry the signals between the IDU and the ODU. Power for the LNB and BUC as well as control signals are carried along these coaxes. Ensure that the ends of the coax cables are properly terminated in F type connectors. There should be 2mm of copper coax centre conductor protuding from the connector in order to ensure a good connection is made. The braided screen of the coax cable must not touch the inner copper conductor. This will cause a short and damage the equipment. Connect the coaxes to the ODU noting which are Tx and Rx then run them to the IDU. The connectors at the ODU should be sealed against the weather with the cables dropping down from the connectors before being taped up to the feed arm. This allows water to harmlessly drip from the cable rather than run into the connector, in other words the connectors should be higher than the cables. The indoor unit (IDU) usually consists of a single box which should be located in a dry, cool and clean place. An office environment is ideal. The coax cables run from the antenna ODU to the IDU and should not cause a hazard to anyone along the way. Use cable ties to clip them safely to pipes, fencing or similar in order to make the installation neat, tidy and safe. Cables that can blow around in the wind will fail long before cables that are securely tied down. The IDU requires a stable mains supply and connection to the end user equipment. This could be further units for telephone exchanges or networks for internet or intranet connections. Satellites are often listed as a bearing from South, but this is the Longitude of the satellite orbit. For example, 53 degrees East (53E) means that the satellite is over the equator because there is no Latitude given (0 degrees is the equator) and the 53 degrees is the angle from South in this case East. (South is 180 degrees). East means that the angle is 180 - 53 = 127 degrees. This then is the approximate Azimuth of the satellite with a Longitude of 53 deg East if you are in the Northern hemisphere around the Greenwich Meridian (0 degrees Longitude). If you are east or west of the Greenwich Meridian then this also changes the angles to the satellite. It is sometimes forgotten that below the equator, the azimuth angles are different, instead of looking south you would look north to the equator. The final step is done whilst communicating with the VSAT network 'HUB' staff and they will ask to adjust the polarisation by rotating the feed. Whilst doing this do not stand in front of the antenna, it is transmitting RF radiation for one thing and your body will block the signal to the satellite for another. Stand to one side and adjust feed in small degree steps until the HUB or NOC is happy. Spectrum analysers are far better but much more expensive and require more expertise to set up and use. Care must be taken not to apply a DC signal to teh analyser as this can cause a lot of damage to an already expensive peice of equipment. The cable from the antenna may have DC on it and so you must first be sure that it is safe before plugging into an analyser. The analyser can display the signals being received in a particular band of frequencies. Recognising these signals is key to finding your desired satellite. Again, it helps if you already know th elocation of a good reference satellite and can clearly see the signals being received from it. In my experience satellites are found mcuh more quickly with a spectrum analyser tuned to look at a known signal for a known satellite than by using a signal meter. The TV receiver (for example a Sky DigiBox) can provide you with signal quality and level information. This is displayed as bar graphs on the TV. Not so useful if you are up a ladder but with the help of someone else you can be told if the signal levels are getting better or worse. If you can see the TV by putting it outside then even better. I have used an RF wireless portable TV attached to the Rf out of a Skybox to be able to see the screen when up the ladder and this was very useful. Obvioulsy, this is only of use if you are pointing a TV satellite antenna.